While yesterday’s cooking included tortillas, more flatbread, and Spanish rice, the real culinary highlights were the delectable dishes from the 4th of July party we attended. The meal began with tasty ribs served with Bone Suckin’ Sauce (a Carolina treat!). On the side were several salads including a perennial favorite, spinach and feta farafalle pasta salad. 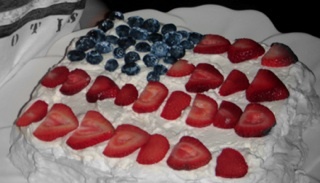 The piece de resistance was a patriotic pavlova adorned with blueberries and strawberries. Despite the hot weather (97 degrees) and high humidity, the meringue was best ever! As a side note to yesterday’s festivities, I had the “opportunity” to discover that a tip from the People’s Pharmacy really did work. Apparently, applying mustard to a burn does help dull the pain. Better yet, the burn which covered parts of three fingers and my palm significantly healed overnight! Of course, the best tip of all would be to use a pot holder! Today’s plans: eating the tortillas and rice…and replenishing the supply of muffins in the freezer.